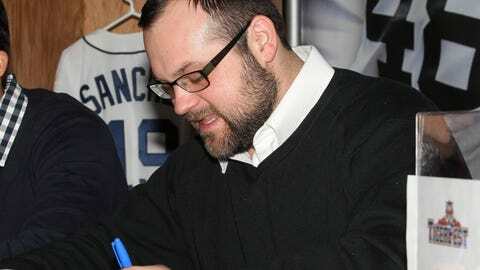 Fans and reporters at TigerFest needed to look at the name on the card to figure out who Joba Chamberlain was. DETROIT — Joba Chamberlain is truly a changed man. Not only is Chamberlain on a new team for the first time since he reached the majors, he looks completely different. Chamberlain, who debuted with the New York Yankees in 2007, signed a one-year, $2.5 million deal as a free agent with the Detroit Tigers in December. Fans and reporters at TigerFest needed to look at the name on the card to figure out who Chamberlain was as he signed autographs and high-fived young fans during the event. "I can have a beard now," Chamberlain said. "I’m excited about that. It’s the first year of my life — college (Nebraska), couldn’t have any facial hair, and obviously in New York you couldn’t. I could have a mustache. Mustaches aren’t that cool. I’m not Tom Selleck. It just doesn’t work." Chamberlain was also wearing glasses at TigerFest. 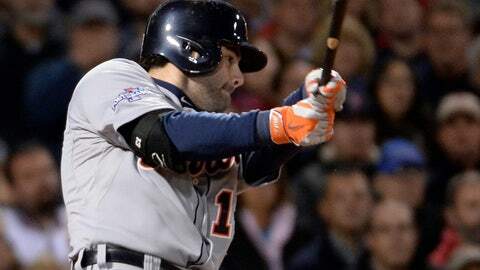 Whenever I think about Detroit's new third baseman, rookie Nick Castellanos, three former Tigers -- Chris Pittaro, Torey Lovullo and Scott Sizemore -- keep popping into my mind. "I wear the glasses because I feel that I look smarter," Chamberlain said. "And I’m too lazy to put my contacts in." But the biggest physical transformation for Chamberlain is the fact that he’s not as big as he used to be. Chamberlain credits Tigers strength and conditioning coordinator Javair Gillett and his own personal chef, Aaron Young, for helping him lose 15-20 pounds this offseason. "Aaron is my best-kept secret," Chamberlain said. "You gotta understand that what you put into your body is going to fuel your body. Obviously I’ve had some injuries here and there. It gets frustrating because you feel like you’re doing everything you can, but there’s always a little more that you can do. It was definitely a step the right direction for me." Gillett gave Chamberlain nutritional guidelines that were passed along to Young, who prepares the meals. All Chamberlain has to do is heat everything up. "He’s going to do all my stuff during the season," Chamberlain said. "He’s going to write down all that I need to do and hopefully, I can get him to be less busy and come see me for a couple times during homestands to make sure everything gets done. We’ve already gone over it for spring training and for the year of what we need to do, how we’re going to make it." When asked how much he weighed at his peak, Chamberlain laughed as he tried to come up with the right answer. "Too big. Too damn big, actually," Chamberlain said. "You go ahead and put that down. It was north of 250." But Chamberlain said he never reached 300 pounds. Chamberlain said he’s eating more fish than he ever has in his life and he’s let go of one of his favorite things. "I cut out cheese, I cut out dairy, and I freaking love cheese," Chamberlain said. "I mean, love. There is nothing better than cheese and crackers, and it’s tough for the football season. I don’t eat much bread, but I’ve never been a big bread guy. But I love pizza. You don’t get this big by not liking food." Chamberlain, 28, said part of the reason he wanted to change his diet was to set a good example for his 7-year-old son Karter. "As his father, you’re creating a habit for him as well," Chamberlain said. "It’s not only creating a healthy lifestyle for me, it’s creating one for my son. That was important to me. "Obviously, it’s going to help me on the field. 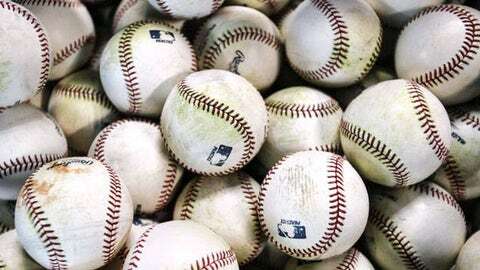 This is a huge part of who I am, to be able to play baseball, but it’s so much more. I want to be around longer for my son. I want to create a lifestyle." That lifestyle is going to be completely different for Chamberlain, who spent the first seven years of his career with the ultra high-profile New York Yankees. Chamberlain won a World Series with the Yankees in 2009, going 1-0 with a 2.84 ERA in 10 postseason appearances . "The change is great," Chamberlain said. "I was fortunate enough to have some great years there (with the Yankees), some not-so-good years, but you learn. I’m in my eighth year and I’m only 28 years old. I’ve pitched in every situation that you can imagine in New York and I just think that helps here for what we’re gonna do." Chamberlain is also excited about what he might do to help the Tigers and revive his own career in the process. In June 2011, Chamberlain underwent Tommy John surgery. For most players, it takes a full two years to return to form. Last season in 45 appearances with the Yankees, Chamberlain was 2-1 with a 4.93 ERA, the highest ERA of his career. He also walked 26 batters in just 42 innings. "I don’t walk guys," Chamberlain said. "I pride myself on that. Just to see my walks last year, it’s frustrating. Part of it is trusting your fastball, too. My velocity came back. It wasn’t forced, it came back, but just the consistency of my slider just wasn’t there." Chamberlain said he started throwing his slider two weeks earlier in the offseason than he normally would. "It’s one of the pitches that can get me back to my delivery, get me back to my release point," Chamberlain said. "It’s a pitch that got me to the big leagues. You can’t go away from that. I want to get back to where it was." Although he had other teams interested in him, Chamberlain said Detroit was his first choice. One reason is Chamberlain observed how much fun the Tigers had when he saw them during batting practice as an opponent. "It was the first place I wanted to play for so many reasons," Chamberlain said. "Close to home, great team, great organization, great sports town. One of my friends (Ndamukong Suh) plays for the Lions and just talks about how great it is here. Getting to know people here, the fans and the people have been unbelievable. The love that they have for you and the excitement that it creates, there were so many reasons to come here." Of course, the main reason Chamberlain wanted to be a Tiger was a chance to get back to the World Series. "It’s become an unbelievable place," Chamberlain said. "I’ve been on the losing side in a couple of playoff series. I’m always a fan of baseball and you see how close they are. Then you become a part of it and you understand why they’ve come so close. Even more so, you understand why they’ve been so close because they never settle. "They’re not happy with just getting to the World Series. And that’s a great credit to (owner) Mr. (Mike) Ilitch and (CEO and GM) Mr. (Dave) Dombrowski and what they have created for this franchise. It all starts from the top. You see it from afar and now you get to be a part of it and you see why everyone wants to play here. I’m looking forward to that."